For 48 hours only, the Plugin Alliance offers a special bundle including Brainworx's bx_bluechorus2 and Unfiltered Audio's Sandman for $39. This Sunday, Waves offers three new plugins with discounts ranging from 40 to 50%. 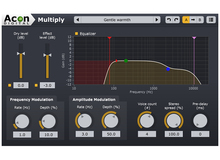 As usual, Waves offers discounted prices on two plugins and one bundle this Saturday. Every Saturday, Waves offers three plugins at discount price for one day only. Brainworx has released a new guitar amp and 4 effect pedals modeled from legendary gear in a special bundle available until October 15th. HoRNet introduces the emulation of the chorus effect that equipped a famous 80s synthesizer. Californian jazz band Utopian Dreams Band released three VST plug-ins for Windows that can be downloaded now for free.